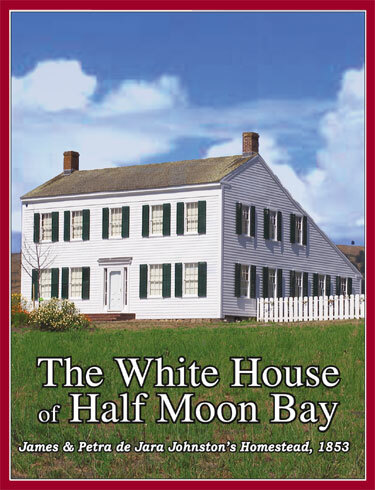 The Johnston House Foundation is proud to announce publication of the second and expanded edition of "The White House of Half Moon Bay, James and Petra de Jara Johnstons' Homestead 1853." He was once the richest man in San Mateo County. He was part owner of the notorious San Francisco El Dorado Saloon where politicians and power brokers gathered. He bought 1,162 acres of untouched land on the coast south of San Francisco and introduced the first eastern dairy cattle into California. But what is left of his legacy is the incredible house he built for his bride on a hill overlooking the Pacific Ocean. His name - James Johnston. Not enough Californians have heard of this forgotten pioneer. Johnston arrived in 1849. The "Annals of San Francisco" printed in 1856 contained pictures of the founding fathers we know so well. Johnston and his brothers worked the gold fields; he developed real estate and helped Hispanic families in disputes over land rights with the United States. He fell in love and married a petite pretty Californiano - residents when California was part of Mexico. More than 150 years ago, he built for her and their growing family what has come to be known as "The White House of Half Moon Bay." Even dating the house posed questions. Although the deed was not signed until May 1853, Johnston sent brothers John and Thomas back to the family home in Gallipolis, Ohio, in 1852 to bring a herd of 800 eastern cattle to his ranch. With brother William, they set out in the spring of 1853 on an exhausting cattle drive across the country. James himself said years later he thought he and his wife moved into the finished house in 1855 or '56. Standing, still in plumb, after years of neglect, the haunted relic was a mystery when Malcolm Watkins, curator of the Department of Cultural History of the Smithsonian Institution, drove past with his new bride in 1962. What was a New England house from the 1600s doing here? He stopped and decided to find out. Joan Watkins photographed the house in detail. They measured, he researched and the result was a monograph on the house. There were rumors of his work and, eventually, a group of early preservationists gathered at the San Mateo County History Museum, formed an Ad Hoc committee to save the house and when the monograph was printed, the group celebrated. That was thirty-five years ago. Watkins' treatise was the single most driving force that preserved the abandoned archaic relic. Three decades later, the efforts of that dedicated group of volunteers, The Johnston House Foundation, Inc., have made the house and its story come alive once more. The updated, revised and expanded second edition of Watkins' original book is off the press and will be introduced on Saturday, January 26, at an invitational event at the house from 1 to 4 p.m. The new edition includes background information from the Watkinses' Interpretive Plan for the House and tells what has happened in the intervening years. Terry Pimsleur, one of the original founders of the group in the 1960s, edited and designed the new edition, which brings the reader up to date. Please email your order to info@johnstonhouse.org.